The Mountain Pastures comprise al that area of the mountain side having as it lower limit the highest altitude attained by the pines, and it higher limit that zone where such alpines as the Moss Champion, the Snow Gentian and other typical alpines supercede the other vegetation. This limit is much more arbitrary than the lower limit, but for the purpose of this book we will take 3,000 feet as the mean height at which one enters the real alpine zone. Nearly all the plants to be described in the ensuing chapters will be found below this limit, although a few are also found at higher levels. The vegetation of these wind-swept mountain sides consists largely of heaths, sedges, rushes, and hardy grasses, while large patches of bog are common everywhere. Rock patches, screes, etc., are found scattered throughout the area. (a) the rock, screes, etc., which dry out quickly, becoming hot under summer suns. These areas support the drought-resisting species such as Sedum Rhodiola, Dryas octopetala, and Antennaria diocica. (b) the grassy areas where we find such plants as Oxtropis Uralensis and Astragalus alpines. © the bogs which are composed of peat soil which is saturated with water and supports sphagnum mosses. Here we find such species as Rubus Chamaemorus, Saxifraga stellaris, and Oxyria digyna. I will describe these three different zones separately. They contain many widely differing species with many interesting devices adapting them to their habitat and to their insect visitors. Among the north-western Highlands, in one of the wildest mountain areas of Britain, lies a group of mountains of austere grandeur. Here are the strange pinnacled peaks of Liathach, Ben Eighe and Slioch, whose fretted sky line stand out so magnificently against a blood-red sunset sky, and are reflected in the waters of beautiful, island-studded Loch Maree which lies glittering in the dying sunlight, the wind gently ruffling the birches and pines that fringe its rugged shores. There mountains, composed as the are of ancient sandstones, limestones, etc., have weathered into many strange forms; pinnacles, battlement-like ridges and needle-like peaks occur everywhere. It is among these mountains on limestone plateaux and dry, barren rocks that one will find the huge carpets of the beautiful Mountain Dryas. This plant is a typical carpet plant. The roots are large and deep striking, and above ground the stem is woody and often as thick as a man’s wrist, giving rise to many woody branches which spread out across the surface of the ground. The main stem attains a great age, as much as one hundred years having been recorded. Each branch bears numerous tufts of small, long stalked leaves which so cover the branches as to form a carpet. They are crenately lobed, like oak leaves, and are glossy and dark green upon the upper surface. Below they are covered with dense coat of white, felt-like hairs, which are of course typical of plants growing in dry conditions. The hairy felt also protects the stomata from the effects of saturation in the spring when the snows melt and the ground is covered with water. In the winter time they roll up so that the lower surface is completely protected. They remain like this throughout the winter under the thick snow mantle. This is an important factor with regard to a plant which keeps its leaves for several years. The very conspicuous white flowers are produced singly on long peduncles. All the floral parts are inserted on the disc-shaped receptacle. The calyx, consisting of eight to ten sepals, is clothed with a black, hairy coat which completely protects the flowers while in bud. The flower itself is over one inch across and is composed of eight to ten white, glossy petals, which in some plants may have a yellowish tinge. At the base of the petals are inserted the stamens, which are very numerous. In the middle of the flower is situated the ovary consisting of several carpels. This floral construction is typical of the great Rose Family to which the White Dryas belongs. The flowers are devoid of nectar, but the many stamens supply much pollen which is sought by many different types of bees, such as mason, leaf-cutters, etc. The many-flowered carpet is very conspicuous as the Individual flowers are so large and showy. The stamens and the stigmas mature at the same time, but as the stamens face away from the centre of the carpels in the middle of the flower, this being the only place where it obtains a good foothold, hence the pollen transported by it is deposited on the stigmas. It does not then matter if any pollen falls on the stigmas from the stamens, as cross-pollination has been effected. As the seed matures the style are prolonged into long, feathery awns. When the seeds are ripe, each carpet separates from its neighbours and the seeds, supported by the feathery awn, drift long distances on the wind to start life far from the parent plant. Thus does Nature distribute its species. 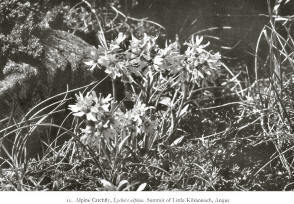 This plant is found chiefly in the north-west Highlands and in the north, especially where limestone is found. 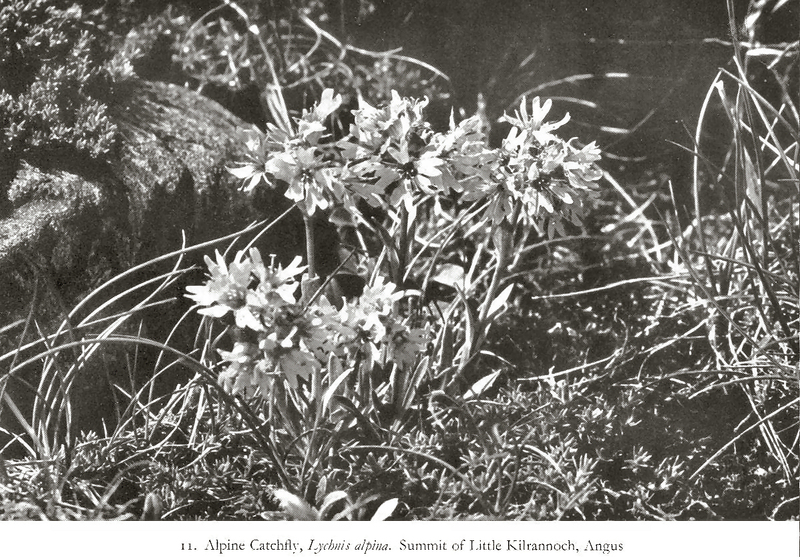 It is not strictly an alpine plant in Scotland, and is rarely found above 3,000. The great family of Composites is well represented in the mountain pastures of the Highlands and at least six species are peculiar to the rocks and screes of these vast areas. They include Alpin Flea-bane (Erigeron alpines), a very rare plant found in the Breadalband Clova Mountains; the Mountain Everlasing (Antenmaria dioica), very common in dry situations; the Alpine Hawk bit (Leontodon pratensis), the Alpine Lettuce (Mulgedium alpina), only found on Lochnagar and in the Clova Mountains, and there very rare; the Alpine Hawkweed (Hieracium alpinum) and the Wall Hawkweek (Hieracium murorum), whose alpine varieties are multitude and are a bugbear to botanists. Other composites such as Gnaphalium supine, although common in the mountain pastures, are also common to the highest mountain areas and have been described under that heading. Deep into the heart of the western Cairngorms runs a wild glen, pine-clad in its lower part but almost savagely beautiful in its upper reaches, where a lonely lake nestles deep among the mountain precipices. Ancient moraines block the valley, and a wild mountain torrent hurls itself down among the rocks and boulders, as it rushes down into its gorge, deep hidden in the black pines. Beyond lies lonely Loch Einich in a setting as magnificent and as savage as anything in Britain. On one side rises the great bulk of Braeriach, his head hidden in the clouds, while on the other side rise the great black precipices of Sgorr Dubh which encircle the far end side of the valley; sheer precipices which shoot up 2,000 feet from the lake shores, their faces cut and scarred by innumerable rifts and water courses; precipices so high that their shadow rests across the southern and western shores perpetually. This lake, devoid of trees and surrounded by steep cliffs and fallen boulders, is very lovely. At the outlet end of the lake is a beautiful crescent beach of white sand surrounded by banks of stones and pebbles. These stony banks and the precipitous shores are perfect collecting ground for the mountain botanist and I have found many interesting plants in the course of a scramble around it. It was here that I found the Alpine Hawkweed among the screes at the side of this lonely lake, its large golden heads starring the somber, black patches of pebbles and small boulders. The Alpine Hawkweed is a typical composite and detailed description will give one a good insight into the reason for the amazing success of the composites in the struggle for life. The root is long, deep-striking tap-root which reaches the moist layers deep down where winter frosts cannot touch it and the summer droughts cannot destroy it. This root is a storehouse for food, where, throughout the long winter, energy is stored so that at the first opportunity the plan can start forth into life. The rootstock is crowned by several oblong, green radical leaves covered with long, white, silky hairs. The are presses closely to the soil so that the stomata are in contact with the dampers air near the soil, and are so arranged that no leaf is covered by another and they receive the fullest amount of light and sunshine. The leaves, spreading outward as they do, prevent any other plant establishing itself within their bounds. This is very important to the welfare of a plant growing in regions where good soil is scarce and each inch of soil must be fought for and held. The hairs on the under surface protect the leaves from excessive transpiration. From the middle of the radical leaves rises a single flower stalk which attains about nine inches in height. It is rough and covered, like the leaves, with long hairs which are often rust colored. There are usually two or three very small leaves on the stalk. It is terminated by a large head of bright yellow flowers, often over an inch In width. It is a very interesting structure and well worth detailed study. Below the head we notice what at first appears to be the calyx, composed of many green sepals. Actually, this is not the calyx but an involucre, the apparent sepals being really bracts which enclose the head of flowers when in bud and protects the blooms from damp and cold. When the head opens the involcre acts as a kind of fence against climbing insects, such as ants, which have mounted the stalk in search of nectar. It is covered, like the leaves and stalks, with long rust-colored hairs. Actually, there are two rows of bracts, the outer one being much shorter than the inner. Each head of flowers contains many small, perfect flowers. If we dissect such a head we shall find that each individual floret consists of a strap-shaped corolla which is tubular at the base. It has four or five teeth on the uppers edge, these corresponding to the five petals of ordinary flowers. Around each floret, and springing from its base, are four or five fine, silky, long hairs which form the real calyx. Within the tube of the corolla are inserted the five stamens and the style. The corolla tube arises from the summit of the ovary, which secretes nectar so abundantly that the tube is often filled to the top. In composite flowers, the anthers mature before the stigmas and cross-pollination is secured by the method known as the stylar-brush mechanism. If we study a newly-opened flower, we shall find that the style is short and the two divisions of the stigmas are pressed close together with their vital surfaces inwards. The style and outer surface of the stigmas are hairy. We shall also see that the anthers form a close cylinder around the stigmas. The style commences to lengthen and pushed the stigmas through the ring of anthers. On so doing the hairs on the stigmas brush the pollen out of the anthers. At this time self-fertilization is impossible as the as the two surfaces are pressed close together. As soon as all the pollen has been brushed out, the stamens wither. The style having now grown out beyond the mouth of the tube, the stigmas open out. When a bee arrives at a young flower and pushes its tongue down into a floret tube to sup the nectar, the stylar brushes dust it with pollen. On going to an older flower, where the stigmas are now mature, the bee will pollinate many florets with the transported pollen. When the florets have been pollinated the flower closes and the involucres close together to protect the maturing seeds. The calyx hairs lengthen and then, one day, the Involucres open and the golden yellow flower will be found to have been transformed into a globe of whitish down. Each seed Is supported by long, white, silky hairs. Then the strong winds, which precede thunder-storms, and the mountain breezes jerk them off the receptacle and, supported by their silky parachutes, they fly away to be distributed far from the parent plant. Thus new territories are invaded in much the way the same way as in modern war. The Alpine Hawkweed flowers in mid-summer, but only opens its blooms in full sunshine, closing them by night and in wet weather to conserve the pollen from damp. At this season insect life is at its climax and the bright golden blooms attract hosts of insects. Hive-bees, hover-flies, flies, beetles and wasps are the flowers’ chief benefactors. Self-pollination, however, takes place very frequently and often the ovules are fertilized without the aid of pollen. This is known as parthenogenesis. It Is fairly common in the Highlands and is easily recognized. In certain places, however, a variety occurs in which the leaves are broader and the flower stems longer, while the involucre is covered with black hairs. This variety has been named Hieracium nigrescens and is a link between H. alpinum and H. murorum, which be described next. This hawkweed, which is so abundant on banks and walls and in woods and thickets in the Lowlands, is also common in the Scottish Highlands. It is, however, so modified by local conditions and by hybridization that a multitude of varieties may be met with, many of which have been elevated to the ranks of species by modern botanist. Over two hundred species of British hawkweeds have been named, most of them being varieties of the present plant. The common form of the Wall Hawkweed which may be found In the lower mountain areas, but hardly penetrates very far into the higher regions, is, in itself, very variable. There is a tap-root with a tough stock from which springs a tuft of radical leaves. They are always stalked and are ovate either with toothed edges or without any teeth at all, and some-times taper into the stalk, at other times being quite-heart-shaped at the base. Their upper surface is usually dark green and covered with short, rough hairs, which, however, may be absent. Their lower surface is usually of a pale green, often smooth, but sometimes downy. The flowering stem is often one to two feet in height and usually has one or two small narrow leaves upon it. It is terminated by a corymbs of bright yellow flowers smaller in size than in the Alpine Hawkweed. There are usually only four or five flowers, but in some specimens as many as twenty or even thirty may occur. The involucres and flower stalks are usually covered with black glandular hairs interspersed with white or rust colored down. It forms colonies on sides of precipices and on rocky hillsides, and banks on the lower mountain slopes where its stem often projects at right-angles from its steep habitant. As we tramp among the higher mountain pastures and glens, we shall encounter many different looking hawkweeds which will be found to be varieties of this plant. I have discovered several around Loch Einich. In one case the flower heads were quite small, less than half an inch in diameter. The leaves, stems and involucres were almost devoid of hairs. No stem leaves occurred and the radical leaves were quite small and obtuse. In another example the stem was short and the flower heads large and reduced to two in number. The involucres were shaggy and the whole plant much more hairy than usual. Enough of attempting to depict the varieties of this very puzzling plant for they are legion, and those who would know more about them must obtain one of the monographs dealings with this very difficult genus. To find this lovely plant, one must search the higher slopes of the wild mountains surrounding the head of Glen Clova (an area famed for its rare alpine plants) and among some of the higher Breadalbane Mountains. Unless one know the more or less exact stations of this rare species it will be an almost hopeless task, for it is very local, as well as very rare. It is a small plant, sometimes only two inches in height and never more than eight inches high. The rootstock is perennial and buried deep in the soil. It sends up a few hairy stems which are terminated by a single flower, or by a corymbs of two or three flowers. At the base of the stems is a rosette of several, lanceolate leaves which are covered with a coat of rough hairs on both surfaces, and these well protect them against drought, when the mountain sides are swept by biting winds or are scorched by the pitiless sun. The stems usually produce a few small leaves. The heads of flowers are bright purple in colour and are about half an inch in diameter. If we examine a head, we shall find that it is composed of an involucre of several rows of imbricate bracts which are also very hairy. The head is composed of two types of florets. The centre is occupied by many, small, yellowish tubular florets and are very similar to those of the Alpine Hawkweed, but they do not possess the strap-shaped corola. The mechanishm with regard to fertilization is very similar to that of the same plant. Around this yellow, central ring, we shall notice another ring of many purple petals. These petals each represent a single floret and are the advertising agents as by their conspicuousness insects are attracted to the flowers. They also act, in co-operation with the involucre, as a barrier against crawling insects who would like to steal the abundant pollen and nectar. The florets of both rings are surrounded by a pappus of many hairs. These lengthen after fertilization of the ovule to form a parachute to support the ripe seeds in their flight. This is another uncommon plat that I have found on the wild shores of Loch Einich. It is also a composite and is related to the common Dandelion. Like it, it has a deep-striking tap-root crowned by a tuft of long, narrow, deep green leaves which are deeply pontific and are usually devoid of hairs, although a few stiff ones may be found on the upper surface. From the middle of the tuft of leaves rises a fairly tall flower stalk which is smooth and fairly robust. At the upper end below the flower, the stem is much enlarged and swollen. The involucres which taper into the flower stalk are covered with black hairs and arranged in two or three rows. The seeds are not supported by simple hairs as in the hawkweeds, but by feathery plumes. The Alpine Hawkbit is found fairly frequently in dry mountain pastures and among screes, rocks and on dry banks. It may be only a mountain variety of the Autumn Hawk bit (L. autumnalis) so common in the lowlands. The Alpine Rock Cresses both belong to the Arabis genus of the great Cruciferous Family and are typical plants of dry, rocky clefts and screes. Of these two plants the Alpine Rock Cress (Arabis alpina) is a very rare mountain plant found on dry, rocky ledges of the Coolin Mountains of Skye, and the Northern Rock Cress (Arabis petraea) is fairly common in the western and northern Highlands. Both plants bring back pleasant memories to me. The former I discovered on a blazing June day on one of the higher peaks of the Coolins (that jagged ridge which closes in the beautiful Loch Coruisk and Loch Scavaig with their strange loneliness and beauty, which when the clouds are low on the Coolins can be weird and almost sinister), when the azure sky was repeated in the rippling sea and all nature was at peace. On such a day as this high up in a stone-filled gully which radiated heat like an oven, I discovered this rare plant. It was growing from the clefts of rock on the sides of the fully, a dry and arid spot where one would scarcely have looked for plant life, although it would be wet enough when the thick clouds hung around the tooth-like peaks. It is rather like the Hairy Rock Cress which is common enough in many Lowland localities. It possesses a rosette of ovate, toothed leaves which are hairy on both surfaces. >From the rosettes arise erect flowering stems which are terminated by a raceme of fairly large, white flowers. After flowering the flowers are replaced by a raceme of long, slender pods. The flowers, which secrete nectar, are visited by small bees and flies, for whom the honey is easily accessible. The Northern Rock Cress I discovered late in May, on my first tramp through that most magnificent of Highland passes, the Larig Ghru. Again I was favored with a blazing sun which turned the Larig into a furnace of unbelievable heat which burned one’s feet and beat fiercely off the granite boulders into ones face. The higher corries of Braeriach were filled with snow and sparkling cascades poured down the steep mountain sides. As I gained the Pools of Dee, I looked back over Speyside, across the Blackness of Rothiemurchus and the golden, broom-covered plain of the Spey to where the blue sea shimmered off the coast of Morayshire. The Pools of Dee seemed so delightfully cool on this broiling day that I decided to rest awhile upon their rocky edge. After bathing my face and hands in the clear waters, I reclined on my back in the sunshine and as I did so, I noticed that in the niches of the rocks were growing many tiny cress-like plants. I dug out a whole plant and found it to be the little Northern Rock Cress which had chosen those enchanted pools beneath the beetling precipices as its home. It possesses a perennial stock with a long, slender root system which threads its ways down into the interstices of the stones. The stock is crowned by a rosette of pinnately cut leaves. From the leaf rosettes arise a short stalk terminated by a small head of fairly large white or purple flowers. 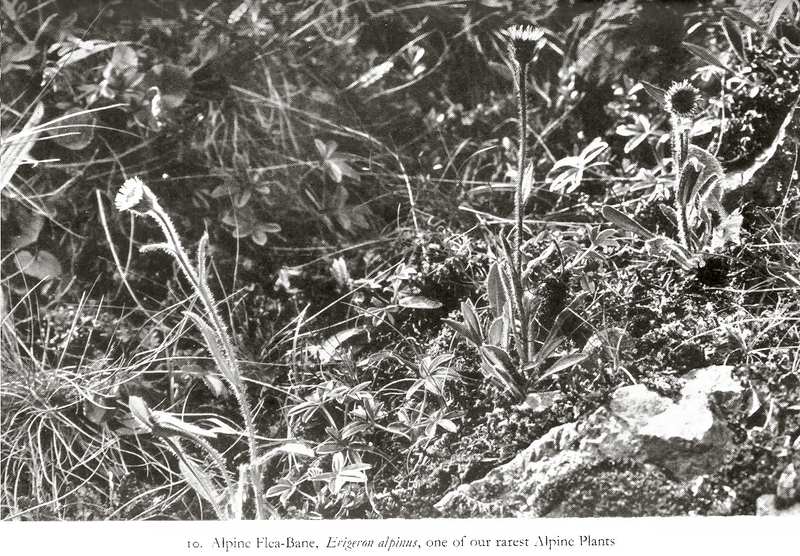 As in the case of the Alpine Rock Cress, the flowers are fertilized by small bees and flies for which two tiny glands secrete nectar. 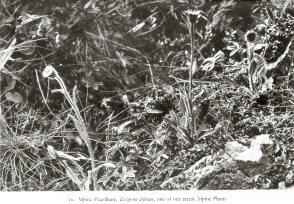 This plant, which is allied to the Rock Whitlow-grass (see p. 29), also possesses a rosette of long, narrow leaves covered with short hairs which are either simple or stellate (several hairs commence at the same spot and radiate from it in a direction horizontal to the leaf to form a star-like pattern). So close are these hairs that the whole leaf has a hoary appearance. This is, of course, a fine example of a drought-resisting device and shows us why this plant is so much at home in dry, rocky clefts and on screes. The rosettes give rise to tall flowering stalks which possess several small leaves, also covered with many hairs. The stems are terminated by a head of small, white flowers which are pollinated as in the case of the Rock Whitlow-grass. This beautiful mountain plant is peculiar in that it is to be found in one solitary station in the Highlands and that, not some inaccessible corrie whose precipices defy the mountaineer, or on the side of some steep crag, but on an open wind-swept moor near the summit of Little Kilrannoch, a low mountain top near the Clova region, so noted for its rare plants. Why should this particular region be so rich in rare and local plants? Why should Lychnis alpina and Oxytropis campestris, to mention but two species, be confined solely to solitary stations there? These are problems which will probably never be satisfactorily solved. This plant belongs to the beautiful Pink Family. It has a tufted perennial stock which is clothed in long, narrow leaves, which are usually glabrous or have a few long, woolly hairs in the lower part. >From the stock arise flower stalks which are seldom more than six inches high and clothed with several pairs of leaves. They are terminated by a compact head of about six pinkish flowers which are very beautiful and constructed inexactly the same fashion as those of the Moss Campion which belongs to the same family. They are similarly pollinated (see Chap. III). Bees and butterflies are the flowers’ benefactors as they alone haves tongues long enough to reach the nectar secreted at the base of the corolla tube. This lovely little plant is of very restricted distribution in the Highlands, due to the fact that it is confined to dry, calcareous rocks. This explains its Perthsire habitat on the limestone schists of Ben Lawers, Ben Lui, etc. It also occurs in Aberdeenshire and Banff. It possesses a very short, perennial stock giving rise to many short, procumbent branches which give the plant a tufted appearance. This is accentuated by the accumulation of old leaves and stems. The branches are densely covered with small, awl-shaped, opposite leaves whose reduced surface cuts down transpiration and hence aids the plant to combat its dry habitat. The flowering stems are erect and from two to four inches high. They produce pairs of tiny leaves at intervals, and they usually branch. They are terminated by tow or three white flowers on erect, slender pedicels which are covered with short, viscid hairs. These prevent ants and other creeping insects from reaching the flowers. Each flower consists of five narrow, pointed, greenish sepals which are shorter than the five ovovate, white petals. Within the corolla are two whorls of five stamens each and spherical ovary with three long styles. The flowers are visited by small bees and flies, but in the absence of their visit’s the styles curve over among the stamens and self-fertilization results. This is a common place of the screes, moraines and rocky places and is distributed throughout the whole Highland area. It is, of course, a member of the Bedstraw Family (Rubiaceae) and is the only typically mountain species to be found in Britain, although one or two other species climb up from the lowlands. Its rhizomatous stem creeps under the stones and rocks and gives rise to erect, aerial stems which are rather more sturdy than in the case of the lowland species. For this reason they have much less need of shrubs and other plants to support them. The stems are four-angled, little branched and without the rough, prickly hairs of most bedstraws. This is, of course, in keeping with its upright habit, the curved climbing hairs of such species as the goose-grass not being required. The leaves, which are lanceolate in form, are arranged in whorls of four at intervals along the stems. They are rather thick in texture with a smooth surface and three prominent ribs. The flowers have a sweet, rather sickly perfumed and are much visited by the smaller bees, flies, butterflies, and beetles. The stamens mature first and, after shedding their pollen, they curl back from the centre of the flower. The stigmas then become receptive, self-fertilization thus being avoided. The fruit, which is green, two-lobed structure with one seed in each lobe, is covered with hooked hairs and bristles. These catch into the fur or feathers of passing animals and birds, and may travel long distances before finally being brushed off.